Artist's Quality Watersoluble Oil Mediums. Holbein's DUO Aqua Oil is a unique and innovative line of water-soluble oil paints that allow for the ease of mixing and clean-up with water, without sacrificing the quality, color strength, and working properties of traditional, oil-based paints. DUO can be inter-mixed with a range of water-based paints including acrylics, watercolours, and gouache, as well as traditional oils. Note: to maintain water-mixability, proportion of traditional oil paint or medium in the mixture should not exceed 30%. In addition to the extensive range of colors that DUO has to offer, Holbein has also crafted a range of oils and painting mediums that have the same water-solubility as the paint. See below for details and pricing. Highly viscous, thermal polymerized linseed oil that increases the transparency of DUO. 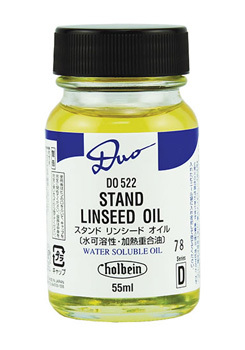 DUO Stand Linseed Oil produces a leveled and enamel gloss effect when mixing with DUO Colors and/or DUO Painting Medium. DUO Stand Linseed Oil creates an elastic and durable film. It can be thinned with water and may develop a milky appearance, but will become clear when dry. 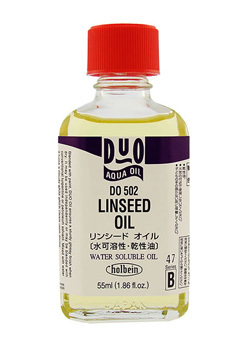 While DUO Stand Linseed Oil may become cloudy over time, performance will not be affected. Available in 55ml bottle. DUO Painting Oil Medium enhances transparency and gloss finish while accelerating drying time. Aids in brush ability and flow. Great for detail. 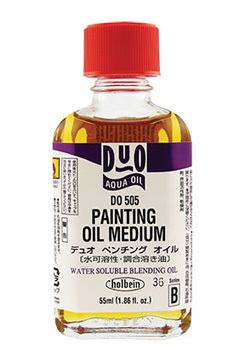 Use DUO Painting Oil Medium alone or with water. Adding water may produce a milky appearance which will become clear once dry. DUO Linseed Oil can be added for stronger surface finish during final layers of painting. While Painting Oil Medium may become cloudy over time, performance will bot be affected. Store in a cool dark place. Available in 55ml bottle. Enhances transparency and gloss finish while dramatically accelerating drying time. When mixing DUO Quick Drying Liquid and DUO Color in equal parts, substrate surface will become tacky in as little as 30 minutes. Adding too much DUO Quick Drying Liquid may cause unstable results. Do not exceed 50%. 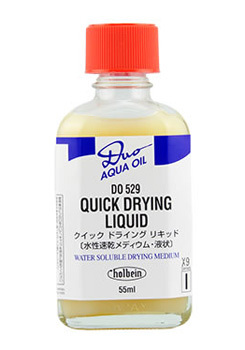 DUO Quick Drying Liquid can be thinned with water, but will reduce the overall effect. A milky appearance from adding water will become clear once dry. While DUO Quick Drying Liquid may become cloudy over time, performance will not be affected. Available in 55ml bottle.